Dr. De earned her degree from Texas A&M University. She also has a BA in psychology from the University of Texas at Austin. 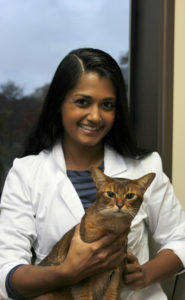 Dr. De has been a veterinarian for over 10 years. As a result, she brings her experience with emergency care and general practice to Seattle Veterinary Associates. She has a special interest in internal medicine and soft tissue surgery. Additionally, she says one of the most satisfying parts of her job is working with fractious cats; she loves finding ways to provide medical care while keeping them calm and minimizing their stress.